We're not exactly sure why this requires a press release now; perhaps some press flack is catching up on the development news. Or perhaps they're being green and recycling last year's news. Anyhow, the "news" is this - Steiner Equities has chosen architecture firm GreenbergFarrow to design a "warehouse-inspired condominium and townhouse project in Williamsburg, Brooklyn... GreenbergFarrow will transform the long-shuttered site of the Old Dutch Mustard Co. into 80 Metropolitan, a six-story building with 114 lofts and nine three-story townhouses". Here's more from Navid Maqami, principal of architecture at GreenbergFarrow: “80 Metropolitan will incorporate many forward-looking design elements but will at the same time incorporate the character of the neighborhood, which was once dominated by factories and warehouses". Having decided to demolish the much-beloved Dutch Mustard building, its really not clear to us why you design a new building to look like a factory. Its even less clear how a "factory" can incorporate town houses. If they wanted to reflect the industrial character of the neighborhood, perhaps they should have saved the the large industrial building in the middle of their site. Oh, wait - they tried: "The factory has been vacant for more than 20 years [funny, we remember a lot of parties there] and Steiner purchased the site in 2006. The company hoped to incorporate the factory directly into the new development’s design plans. But after weighing construction code issues, handicapped access, and several design schemes created by GreenbergFarrow, the company decided to build from the ground up and create a residential complex that would capture the neighborhood's historic architectural style motif. 'We tried really hard to see if we could build around the existing construction, but it was not possible,' says Maqami." 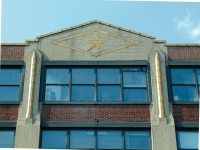 The Dutch Mustard Building did a pretty good job of capturing our "historic architectural style motif". Plus, it would have been a lot more "green" to reuse the building. 80 Metropolitan (from โบนัส 100 % กีฬาNew York). Credit: Courtesy of Lou Madigan (l); courtesy of Kim Wendel Design LLC (r). New York's Justin Davidson has written a long and thoughtful piece on the architectural transformation of New York City these past few years (its a week or two old by now, but we're just getting around to it). The article includes before and after pictures of 54 of the 76,000 (!) new buildings constructed since 1993, as Davidson attempts to answer the question "has this ferment improved New York or eaten away at the city’s soul?". In the end, Davidson concludes that while "[it] would be wonderful if we could stem the Avalonization of New York simply by demanding better buildings... (Good Design Now! )", "most architecture in any age is crap, and today’s crap isn’t as bad as yesterday’s". Based on his analysis, we can buy that, though his thesis certainly applies better to Manhattan than Brooklyn. Why does Brooklyn (and LIC) get all the missed opportunities? We couldn't have said it better (though we have certainly said it fairly often). 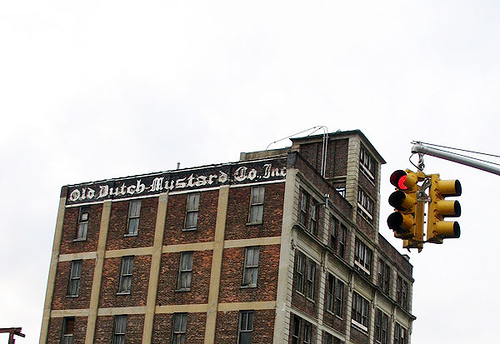 As reported in Curbed and Gowanus Lounge, Steiner NYC, the developer of the former Old Dutch Mustard site, has a new ad running in New York magazine, in which it claims that it "has converted the Old Dutch Mustard Warehouse at 80 Metropolitan Avenue... to a residential development". This, of course, is fantastic news. We had assumed that since the Old Dutch Mustard had long ago been reduced to a pile of rubble that any "conversion" was out of the question. Hence the red "LOST" designation on the picture to the right. 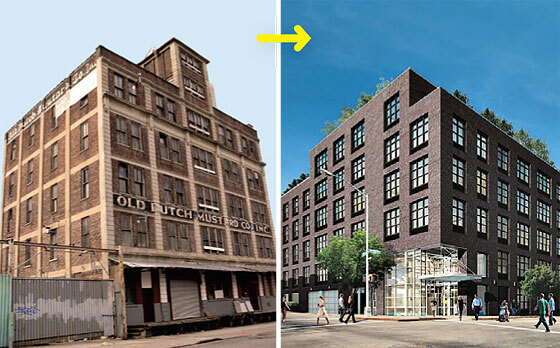 Clearly, though, Steiner NYC has found a new model for adaptive use of historic structures - one that does not actually require that you have an historic structure to adaptively reuse. This is also a clearly a major victory for the 4 Boro Neighborhood Preservation Alliance, who listed ODM on their landmarks wish list of 2007. 6 months after the building had already been reduced to a pile of rubble. This latest bit of marketing is brought to you by the same geniuses who back in March claimed "80 Metropolitan will [...] incorporate the character of the neighborhood, which was once dominated by factories and warehouses." By "incorporate" they, of course, mean reduce to a pile rubble.